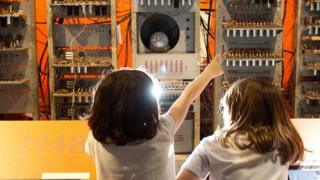 Seventy years ago was arguably the start of the modern computer age. A machine that took up an entire room at a laboratory in Manchester University ran its first program at 11am on 21 June 1948. The Manchester Baby, known formally as the Small-Scale Experimental Machine, was the world's first stored-program computer. It paved the way for the first commercially-available computers in a city known for centuries of science and innovation. Dr "Tommy" Gordon Thomas was 19 and in the final year of a physics degree at Manchester when he met Sir Freddie Williams, who designed The Baby with colleagues Tom Kilburn and Geoff Tootill. Now aged 90, he talked to BBC News from his home in New South Wales, Australia, about his memories of the ground-breaking machine. "My job was to build a cradle for the baby," says Dr Thomas. "It was a group of people who had worked together during the war who introduced us youngsters into the same process of getting on with the job…It was really an adventure for us all." The physics graduate joined the project just after its first successful run, working on the computer for his MSc. He recalls an old laboratory in a dirty, neglected building of the then Victoria University of Manchester. "After the original proof of The Baby we needed various other features and my work was mainly in constructing the memory, and we went into another little room and we built that," he says. "And when that was working we moved all the equipment from one very little cramped room. "Manchester at that time, just after the war, was full of smoke and dust, and it was a miracle we got things to work at all." The scientists behind The Baby worked with the company Ferranti to develop the Manchester Mark 1, which in turn led to the Ferranti Mark 1, the world's first commercially available general-purpose computer. The fusion of academic excellence and commercial skills helped turn a dream into a reality. "It's one thing having an idea and another thing bringing it up to market and so on,'' says Dr Thomas. "Fortunately it was pure coincidence that Manchester had both components - they had the ideas in the university and they had the engineering and production and commercial skills just a few miles away in the Ferranti factories." Dr Thomas will be celebrating the 70th anniversary of the project from his home in Australia. Meanwhile, fellow Baby computer pioneer Prof David "Dai" Edwards, also aged 90, will be in Manchester for a special event at the Museum of Science and Industry, which hosts the world's only working replica of The Baby. Prof Edwards, who went on to head the computer science department at Manchester University, says the developments from the early days of computing are incredible. "We had no idea where everything would lead to," he says. "The smart phone, for example, is amazing." Dr Thomas says the discoveries likely in the next 70 years will be out of this world. "When we start going inter-galactic which will happen in 70 years we might even find some society out there somewhere," he says. Looking back, though, he says some of the greatest innovations in his lifetime have been technologies that connect people, like the Skype line he used for this interview. "In my opinion the greatest discovery post The Baby was the Internet," he says. Tim Berners-Lee created the first web browser and editor and Dr Thomas added: "Tim was the son of an engineer who worked at Ferranti and Tim Berners-Lee's mother was another very remarkable scientist." He said the internet concept came "just in time for me to retire and use it. So that was a radical change in the way we used our investment around the world". Dr James Sumner, lecturer in the history of technology at the University of Manchester, regards the development of The Baby as a milestone. "It is the first machine that practically worked in the world using what is called the stored program," he says. 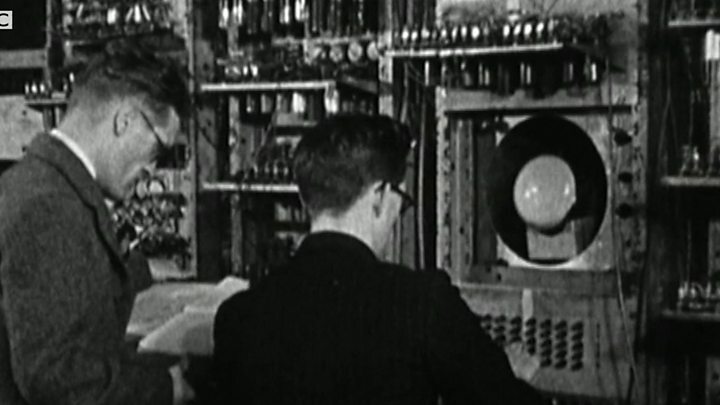 The prototype machine paved the way for commercial computers and was technically the first computer bought and sold, even though, the bill, made out in February 1951, was sent to the University of Manchester. Dr Sumner says the developments since then have been "astonishing". According to his calculations, the prototype machine that first ran in Manchester on 21 June 1948 could store 1024 bits of information, each "bit" being a zero or one. In contrast, a smartphone today might have 64 gigabytes of storage, which is 500 million times as much. The 1948 machine was fast for its time, working at a rate of roughly 1,000 instructions per second. Yet a modern processor for a laptop or tablet might reach 20 or 30 million times this speed, says Dr Sumner, and the instructions involved would be much more complicated. The Baby machine was made up of a series of equipment racks running over five metres along the length of the room and weighed about a tonne. Using the same space today it is possible to build massively powerful supercomputing machines, such as Manchester's SpiNNaker project, which is designed for simulating brain functions.